I did it. My friends told me not to, but I didn’t listen. I never listen. Why didn’t I listen? 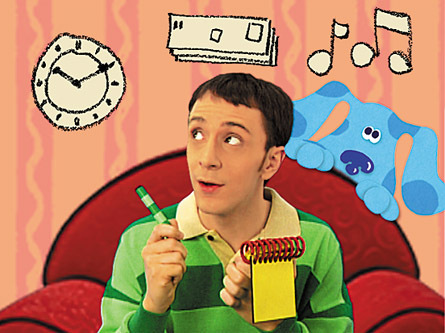 “A mashup of 50 Shades of Grey and Blue’s Clues?” they said, “That sounds wrong.” I told them it wasn’t. I told them it would be funny, and I wrote it anyway. At first it seemed harmless, even humorous, but soon it became something outside my control. When I began to write, I didn’t know what would become of me. I know now. I composed a tale of mystery, and of lust. A tale of intrigue. A tale of humans, and of dogs, and of anthropomorphic salt and pepper shakers. But as the work continued, the nature of the fiction changed. Soon, it seemed that I was no longer writing the fan-fiction; the fan-fiction was writing me. I felt uneasy, then frightened, then physically ill. I ground my teeth into nubs as the words flowed from my keyboard, and I felt myself begin to die. What began as a goofy crossover had evolved into a world-ending rival to Necronomicon, and it haunts me to my very core. I am different now than I used to be. I remember a time when the night brought only darkness. I yearn for those days when dusk would bring with it the end of a day, be it good or bad. Now, when the sun sets, it brings only the knowledge that there is no blackness deep enough to drown the memory of what I have created. Of what I have done. When midnight comes and the world slumbers, I cannot rest. I am left to stew in my own sins and to pray to God and Magenta for forgiveness. I wish only for death.